by Gregory C. Ellison II. Abingdon Press, 2013. “Cut dead is a nineteenth-century idiom meaning to be ignored deliberately or snubbed completely. . . . being cut dead is torturous.” This phrase reveals Gregory Ellison’s profound concern with African-American young men in the United States. Now a pastoral care professor, Ellison was once himself “cut dead,” and he moves back and forth between these worlds as he shares the uncensored stories of six African-American young men between the ages of fifteen and twenty-four. 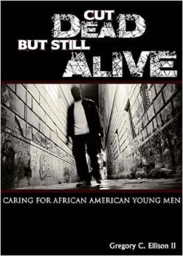 In turn, Ellison offers tools and strategies for care-givers who encounter anyone who feels invisible, demeaned, and hopeless, especially young black men. Ellison’s theory is that these young men have experienced a death of “control, self-esteem, meaningful existence, and belonging.” These deaths, says Ellison, must be countered by “fearless dialogue, interrupting hope, miraculous solutions, and the community of reliable others.” Ellison’s work is a must-read for all leaders, both in and outside of the religious community.